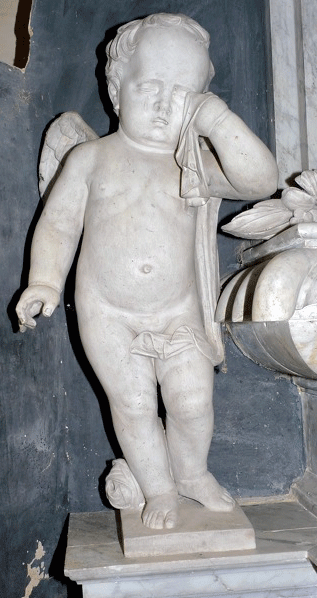 When I take photographs or when I am sent photographs as e-mail attachments, I save them on my computer's hard disc. 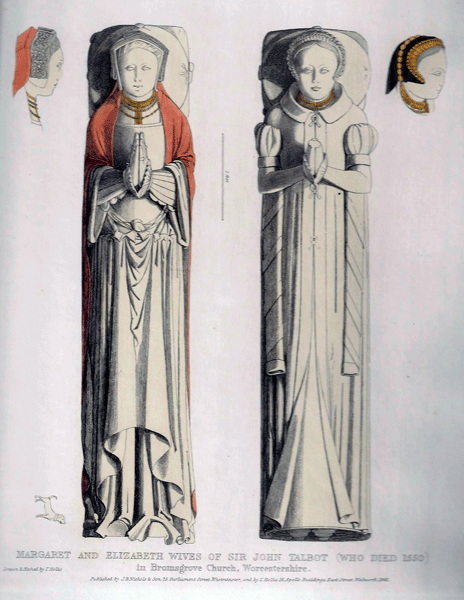 These are then copied and one copy used to be saved onto a disc but are now saved onto the smaller, more convenient USB keys, which have a much larger capacity and, I understand, are less prone to failure. 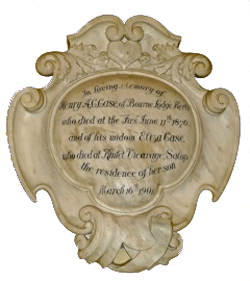 The other copy is edited, compressed and reduced in size and transferred to the web pages which, in due course, are uploaded on the web site on the internet. 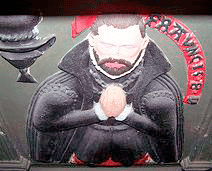 The first photographs thus were saved onto a number - half a dozen or more - discs but a number of years ago I transferred all the material from these discs onto USB keys. 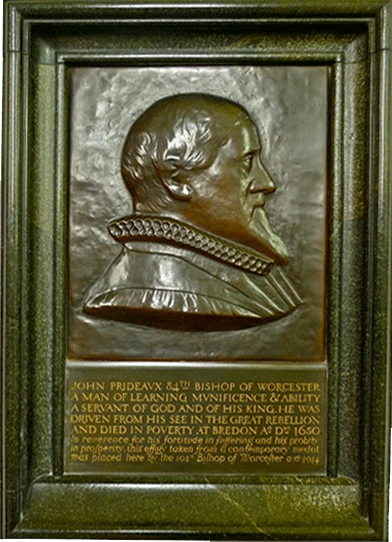 Unfortunately just one disc had become corrupted in some way and the photographs could not be recovered or transferred and were lost: these were from Worcester Cathedral and York Minster, all taken by me, and several photographs from Worcestershire all sent to me; and possibly others The only copies of these were on the web site pages and were really too small, necessarily so because originally I had limited web space. 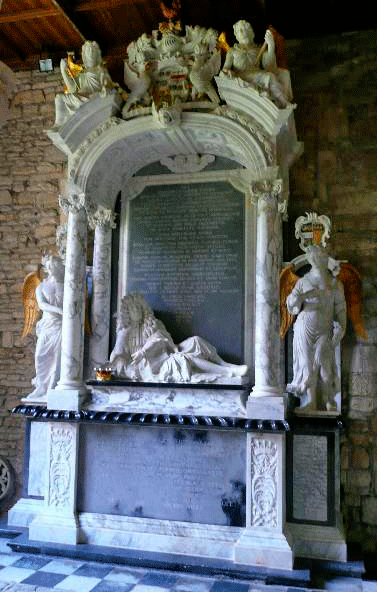 These photographs cannot now be enlarged but I have tried to reedit and improve them. 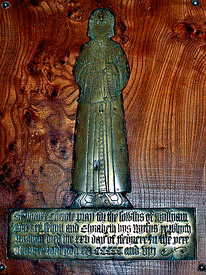 I must point out that the faulty disc was manufactured by Philips; all the others which were perfectly satisfactory were from other companies. 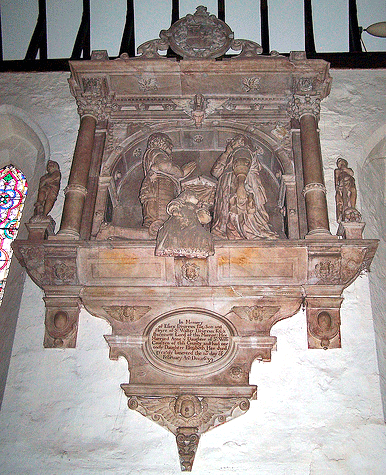 Above column one: Robert (1573) & Anne Blount. 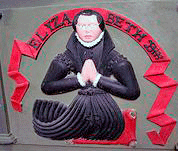 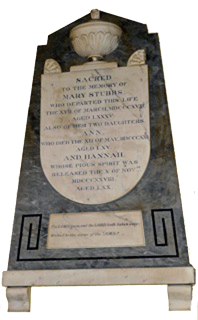 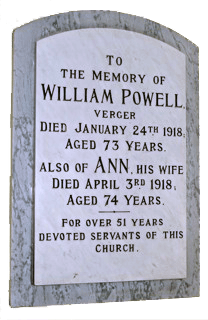 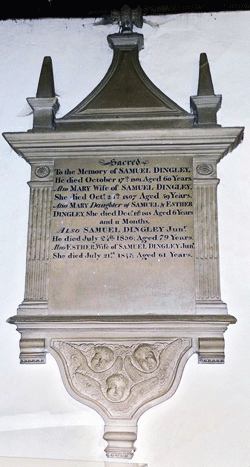 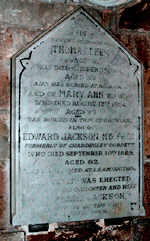 She was the daughter of Hugh Fisher & Jane Wall of Emley Lovet. 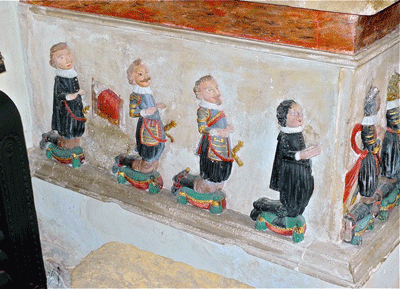 Four children depicted on the sides of the tomb chest: Margaret, Thomas, Walter & Elizabeth. 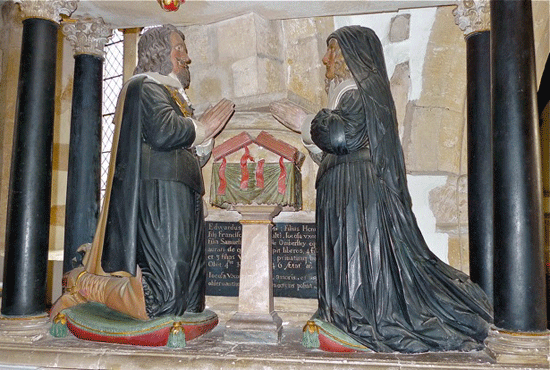 Anne holds prayer book with the quotation: 'O Lord Consider our desire'. 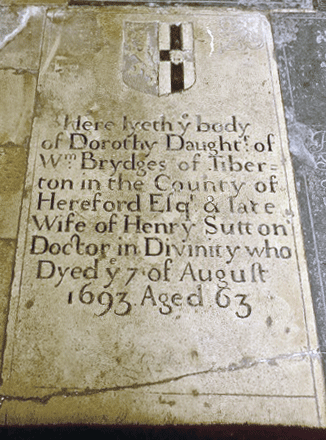 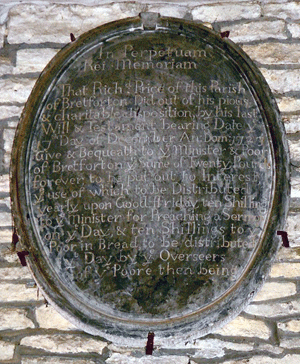 'Here lieth the body of Robert Blount who deceased 1575 and Anne his wife being yet living desires God to continue her life'. 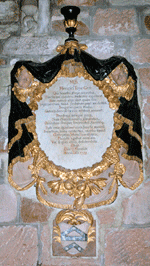 The Blounts paid fines as Catholic recusants. 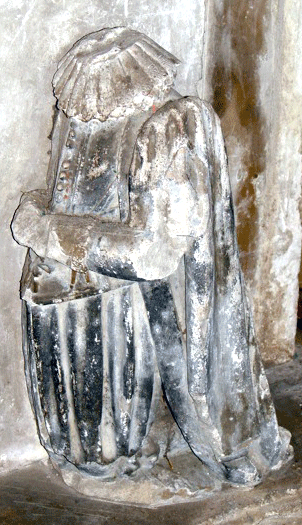 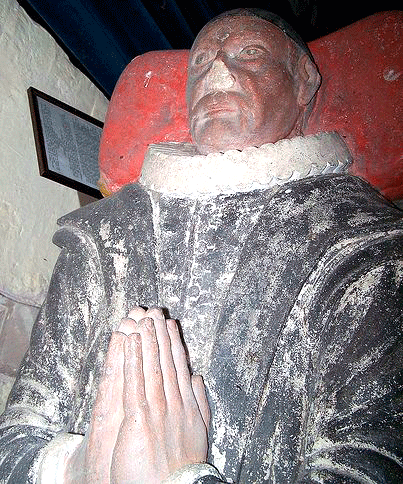 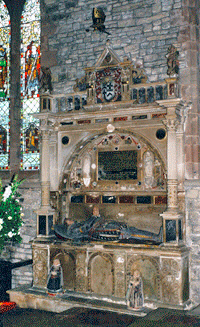 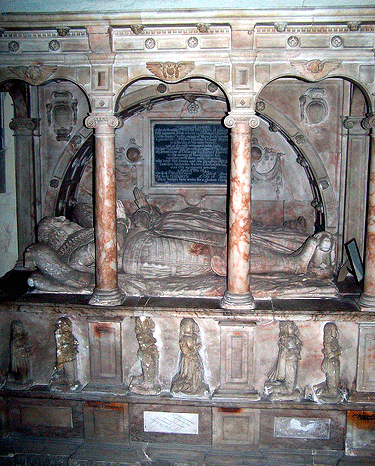 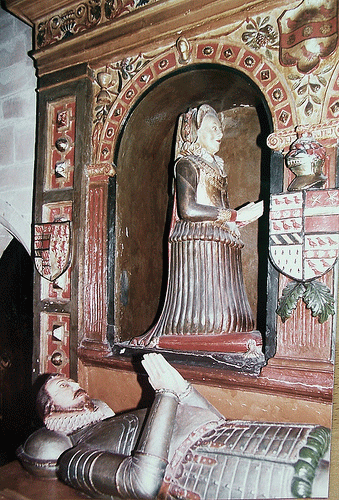 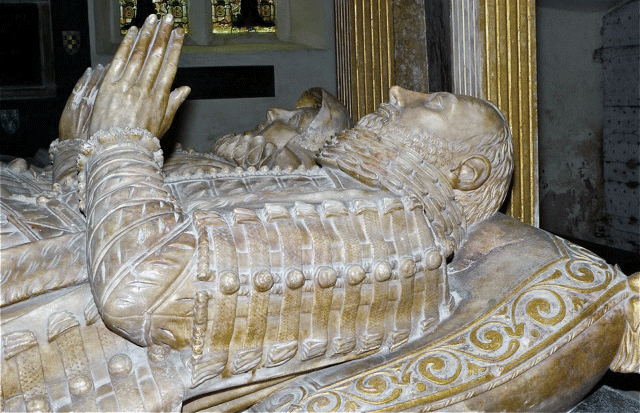 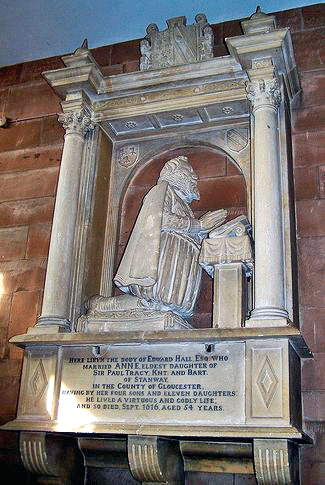 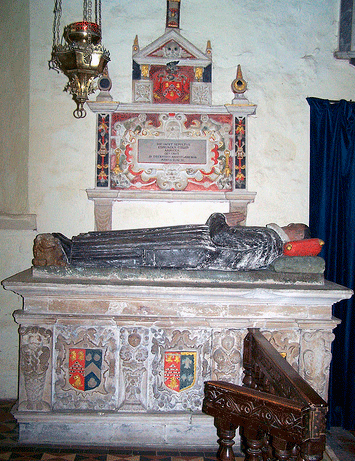 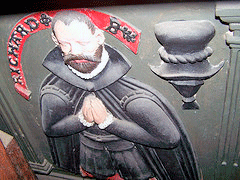 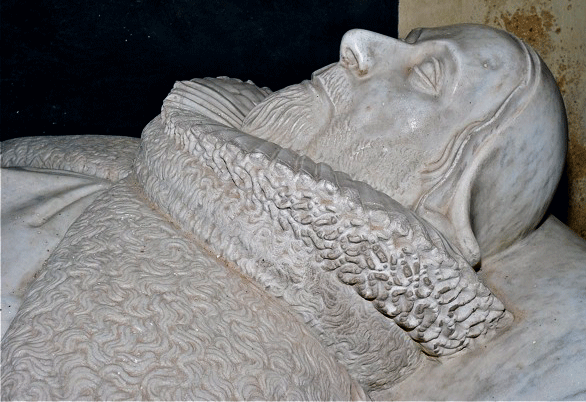 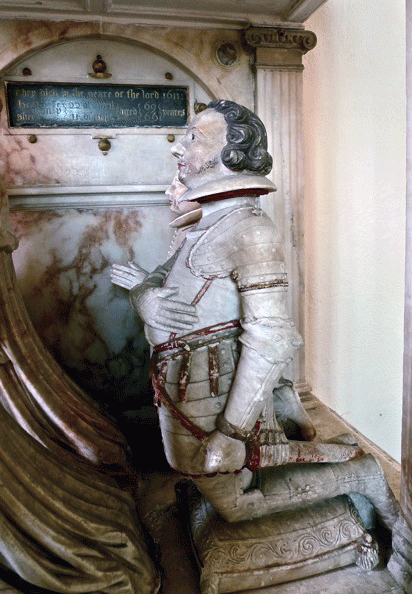 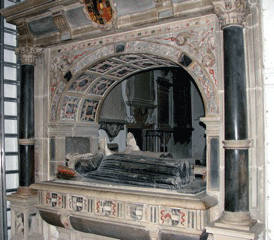 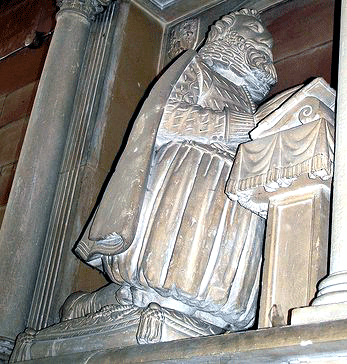 Above column two to six: Walter Blount (1561), son of Thomas Blount of Kinlet & Isabel Acton (1562) (Walter is the younger brother of John Blount, monument at Kinlet, Salop). 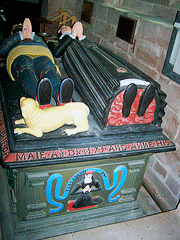 The children represented around the tomb chest are shown below. 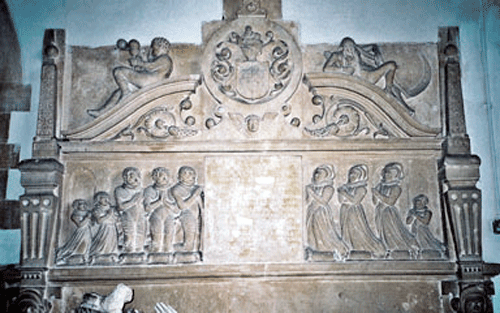 All top and left: Richard Hoby (1617), Wife and family. 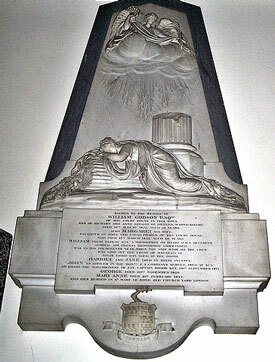 Whole monument and details. 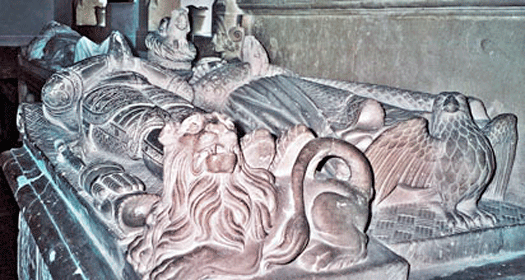 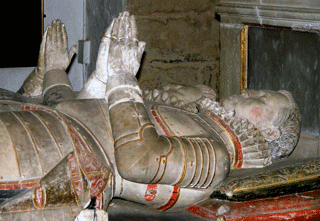 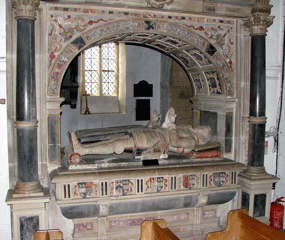 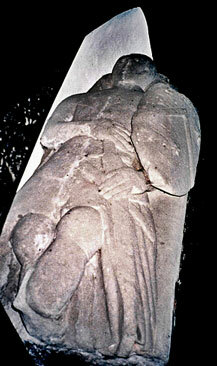 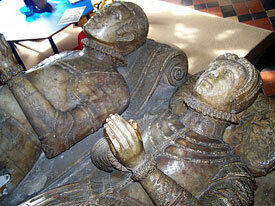 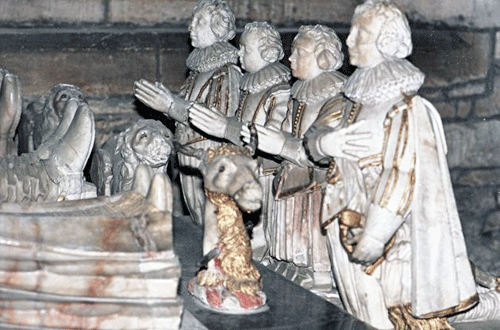 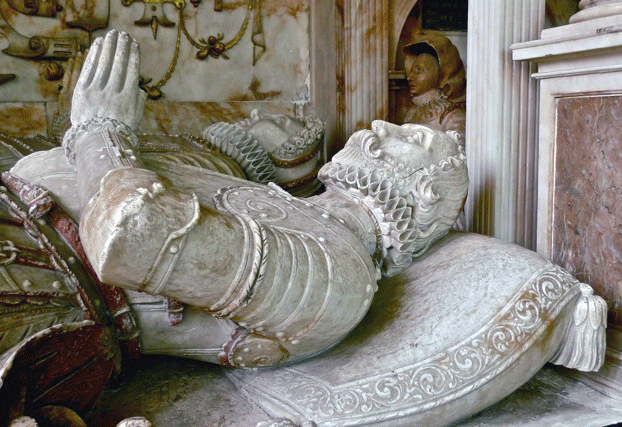 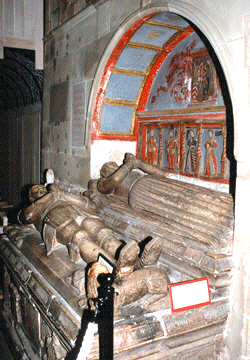 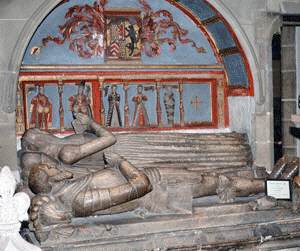 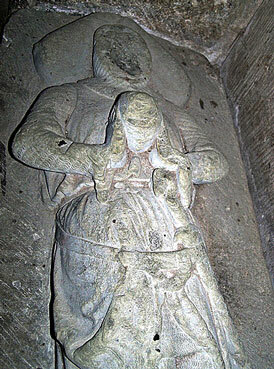 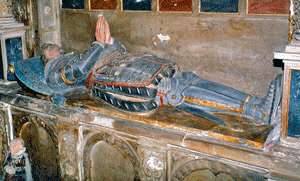 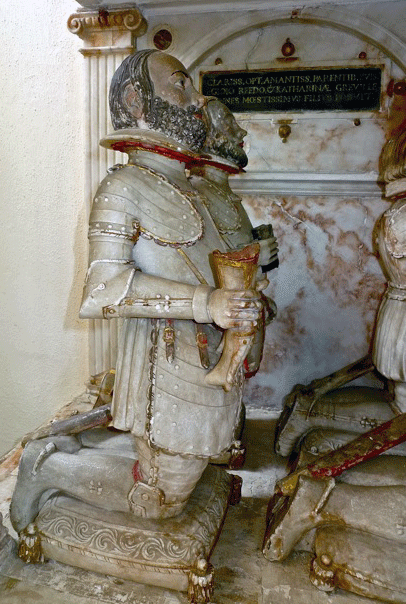 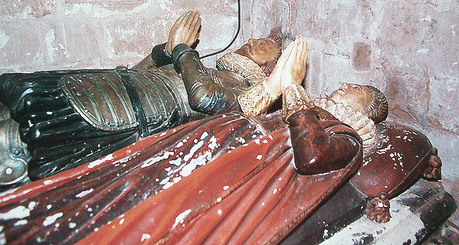 Two of the figures are headless but the monument retains some of its polychrome. 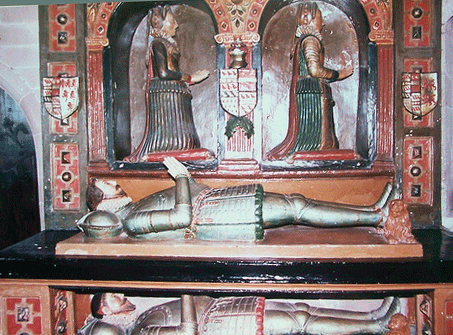 One of the kneeling figures is now recumbent: mentally rearrange the legs and you will see its original kneeling position. 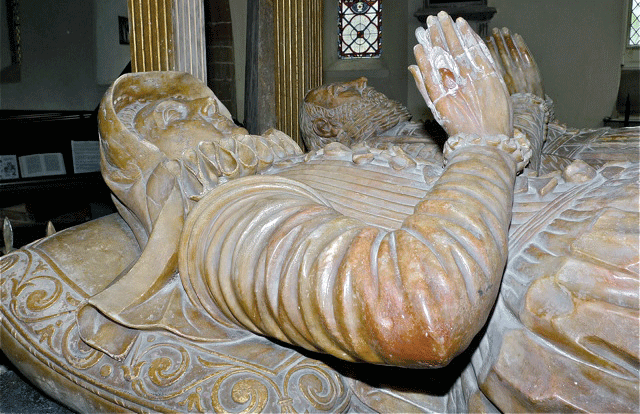 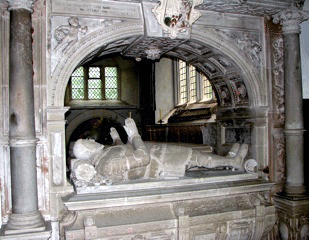 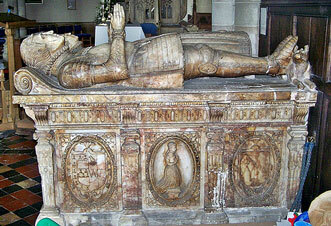 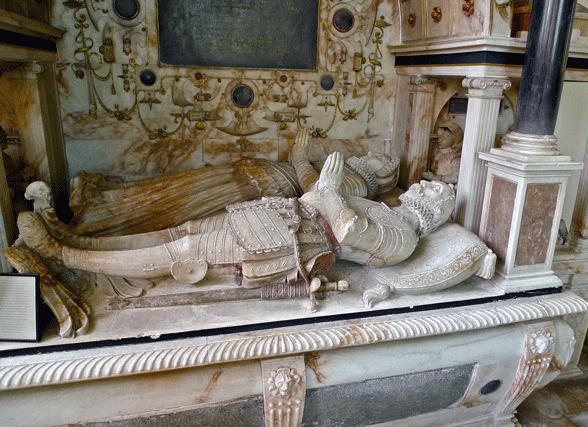 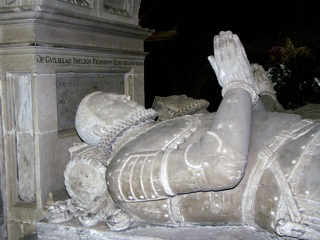 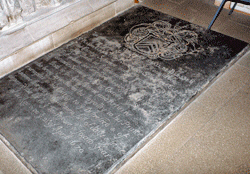 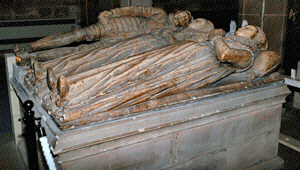 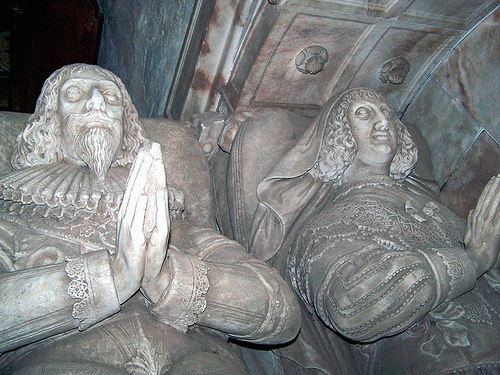 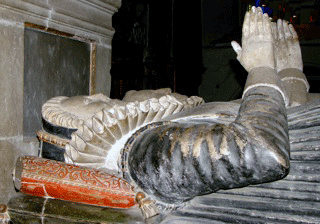 Richard Barnaby (1597) & Mary (Abington/Habington)(1574) Sandstone. 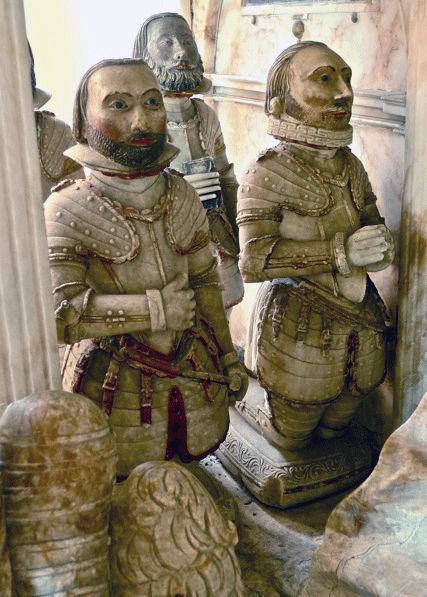 Note the helmet which is positioned between the heads of the main figures. 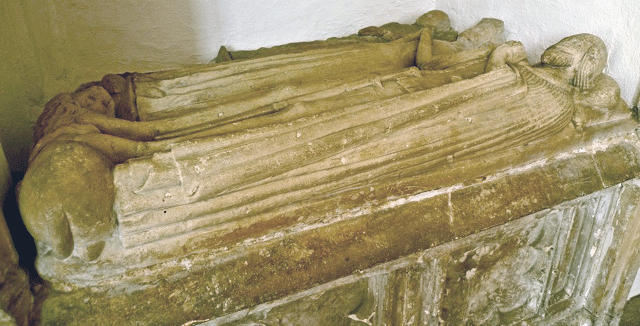 Right: Coffin lid with cross and bust; now upright. 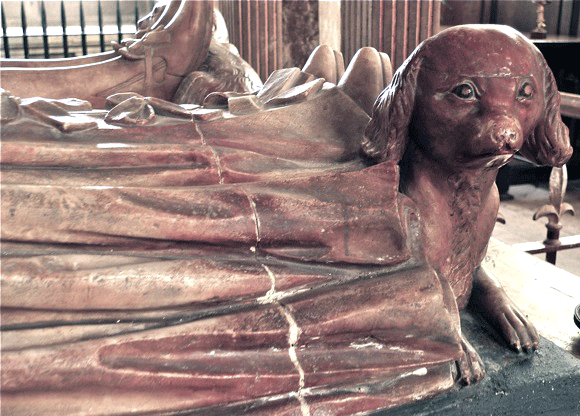 Early to mid 14th century. 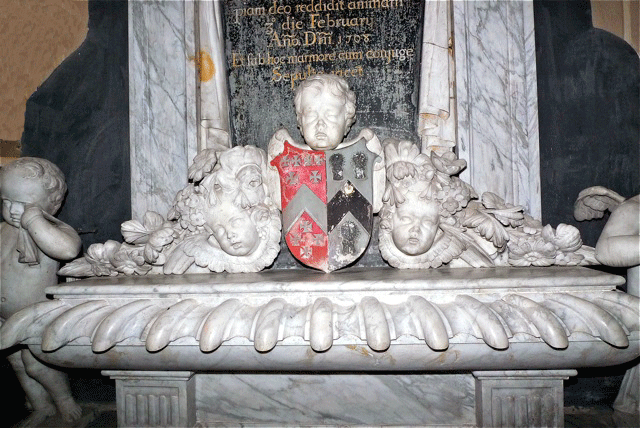 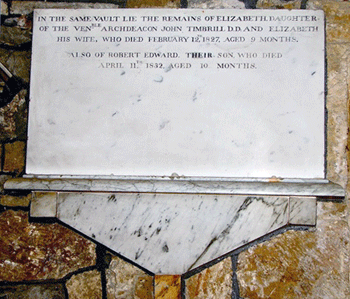 Top right: 'In the same vault lie the remains of Elizabeth daughter of the Venble Archdeacon John Timbrill DD & Elizabeth his wife, who died February 12th 1827 Age 9 months. 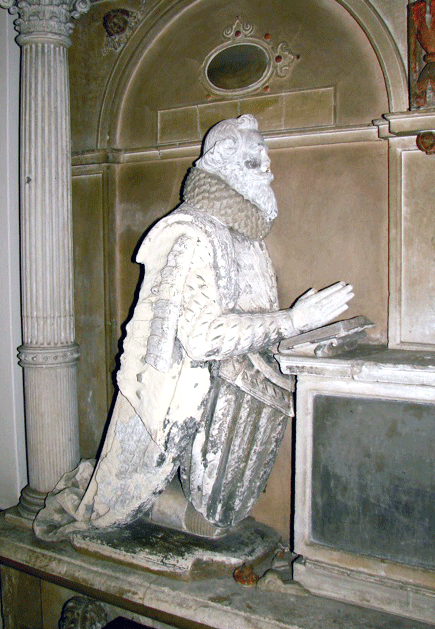 The church dates from 1763 and is by Lancelot (Capability) Brown, who removed the earlier monuments from the medieval church and reset them here. 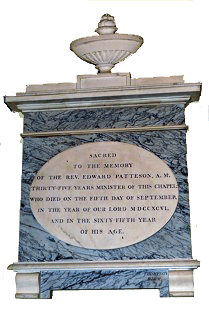 The earldom began in 1697 and the 6th Earl was responsible for the current church. 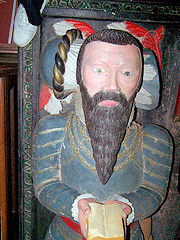 Thomas 1st Baron Coventry (1639) He was Lord Keeper of the Great Seal. 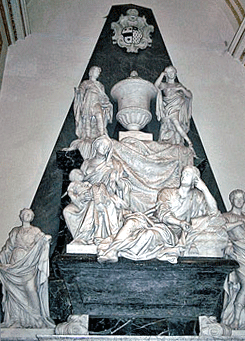 Note the mace and the several allegorical figures; Justice holds the seal. 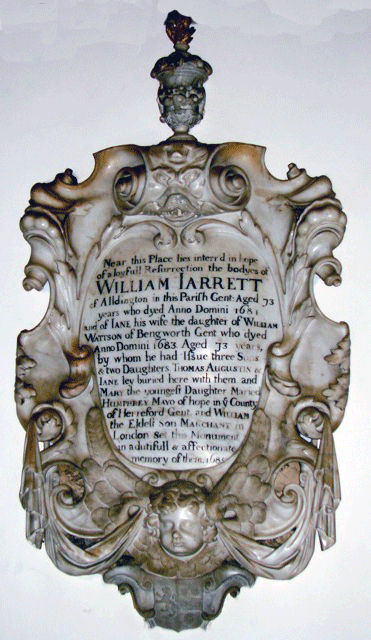 Attrib. 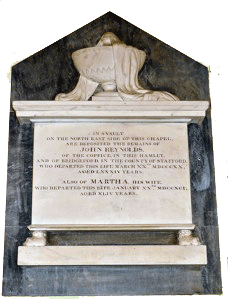 to the workshop of Nicholas Stone. 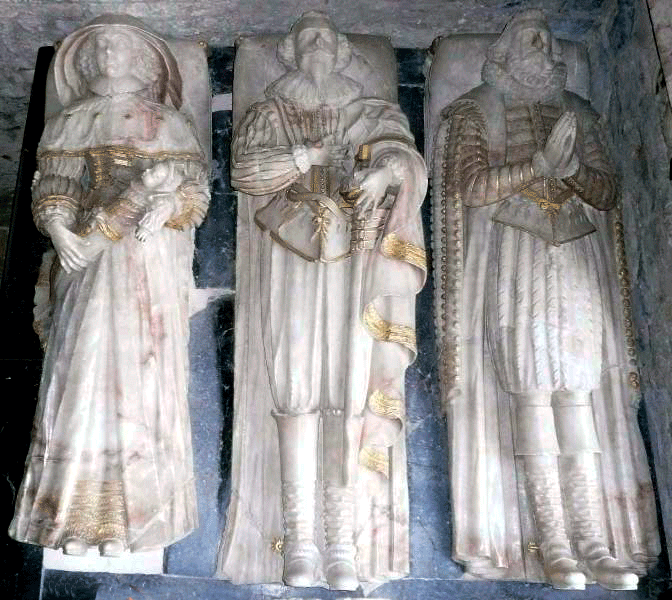 Top left: Thomas, 2nd Baron Coventry. 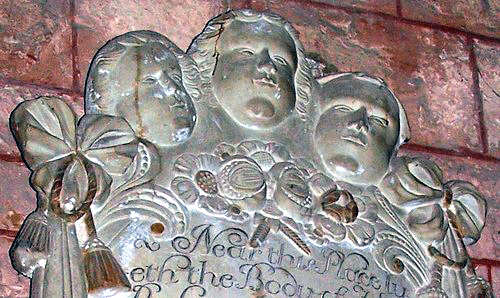 Top centre: Lady Coventry. 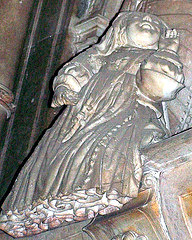 She holds her baby and a close up may be seen below. 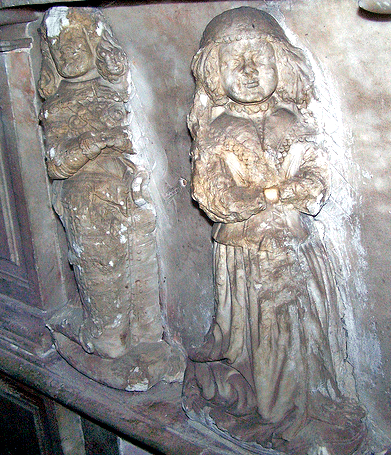 Above: Two kneeling children who can just be made behind the pillar at the foot of the reclining Lady Coventry. 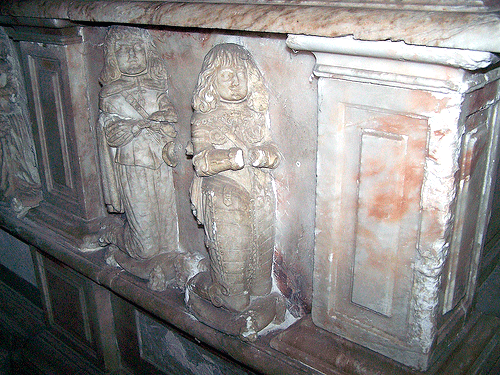 Above can be seen details of children (male) kneeling at the foot of the monument. 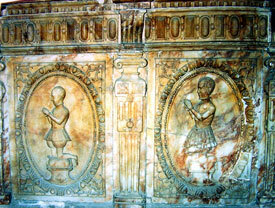 Male and female children can just be seen kneeling at a prayer desk on the left side on the main photograph. 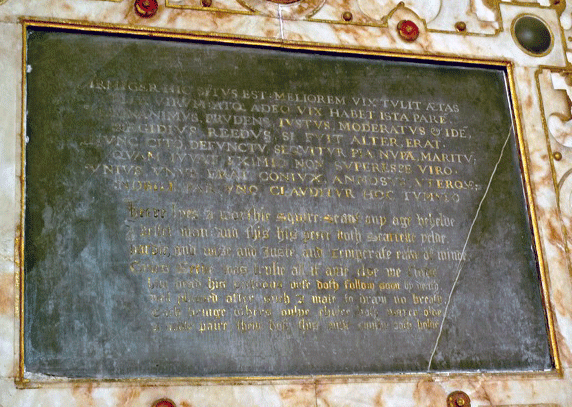 Right: The epitaph on the wall on the left hand side of the tomb, the lower part of which can be seen in the main photograph. 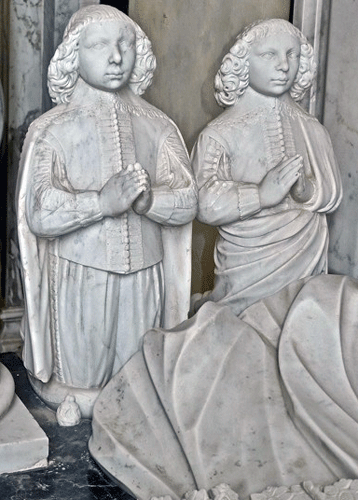 Left: Monument to Edward Dineley & Wife (1646); Centre top are details of the armorial bearings on top on the monument and Bottom details of the kneeling figures; Right top are details of the children kneeling either side of a prayer desk, boys at the foot, girls at the head. 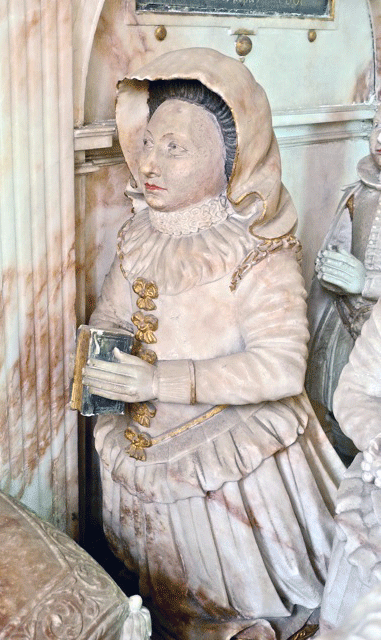 A small boy curiously kneels on a pedestal. 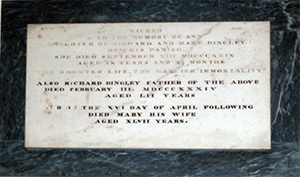 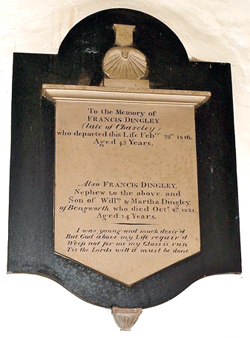 Francis Goodyere Dineley Commander RN (1908) Richard & Mary Dingley (both 1834) & others. 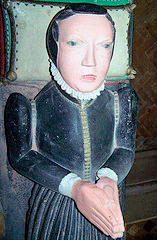 Lady Mary holds a baby, four children kneel at the feet where is also a stag's head with an arrow unpleasantly piercing the neck. 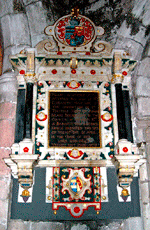 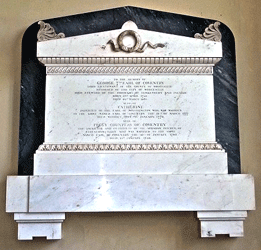 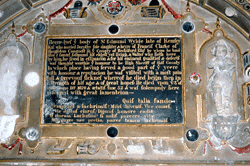 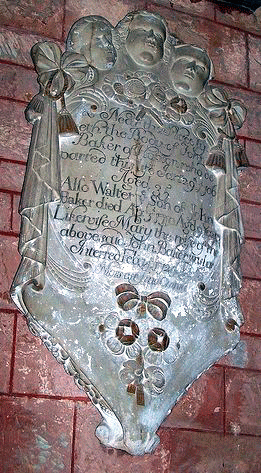 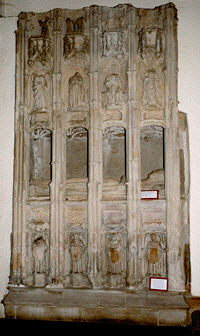 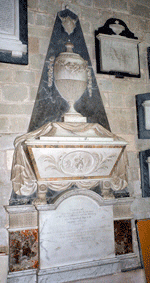 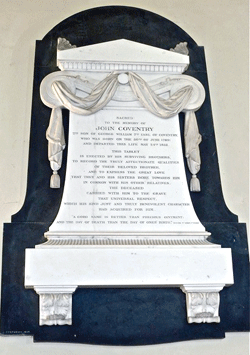 There are two back plates to this monument: one is shown below centre. 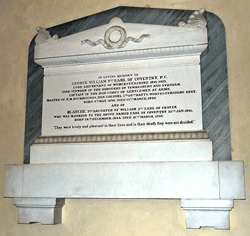 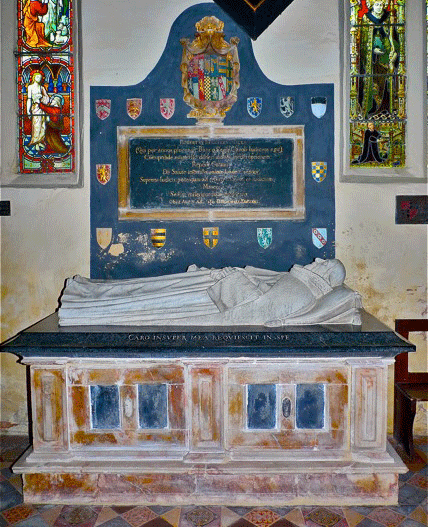 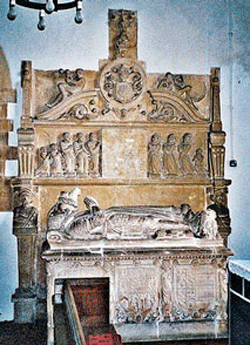 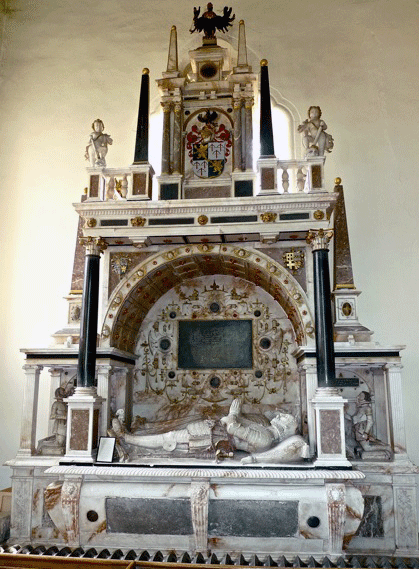 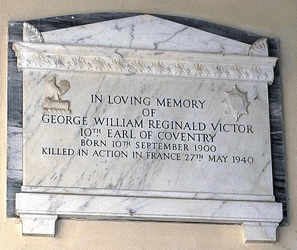 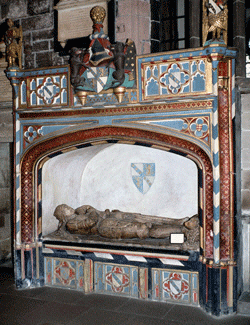 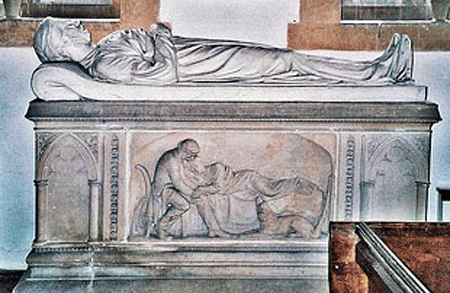 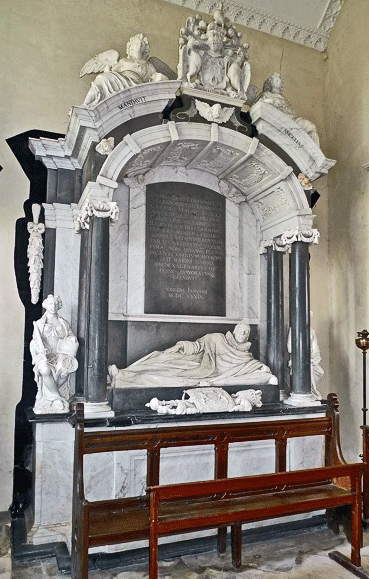 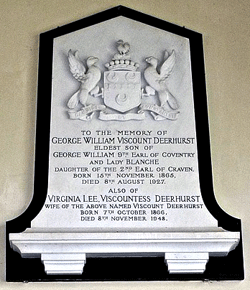 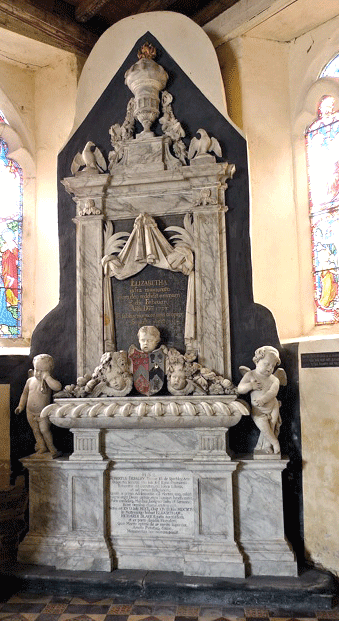 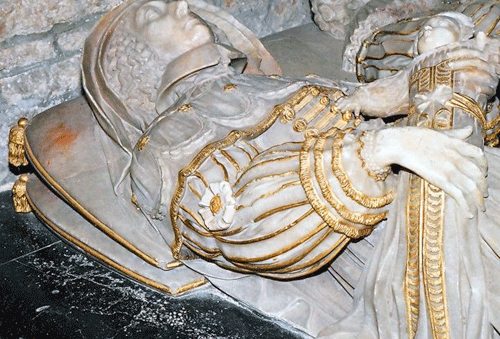 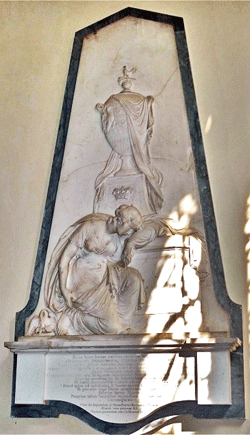 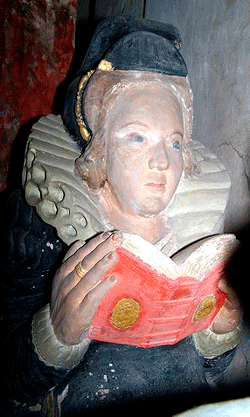 The Second Earl refused to have this monument erected in Croome d'Abitot church, the funerary chapel of the Coventry family. 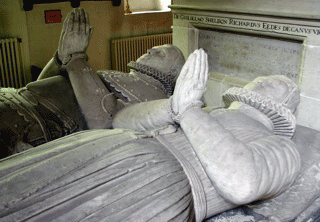 His reason is revealed by the improper achievement of arms and false epitaph on the monument. 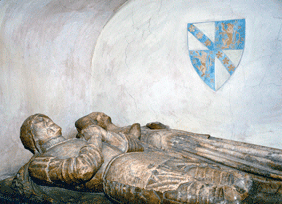 'Or, on a chief sable, three escallops of the field a crescent gules for difference'. 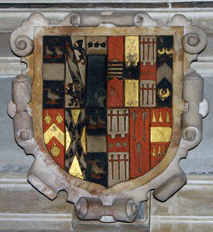 These are quite legally the arms of the Grahams of Norton Conyers, Yorks, but are impaled with those of Coventry, implying that his second wife was gentry, a Graham, and armigerous. 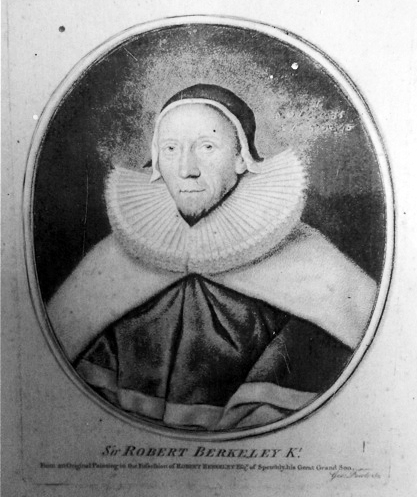 The Second Earl maintained that his father's second wife was the daughter of Richard Grimes a common waterman, and that she had been a servant of the Coventries, and maid to the Lady Winifred his mother. 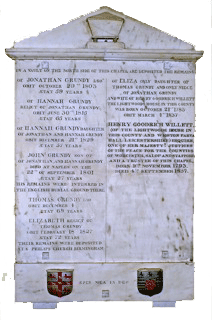 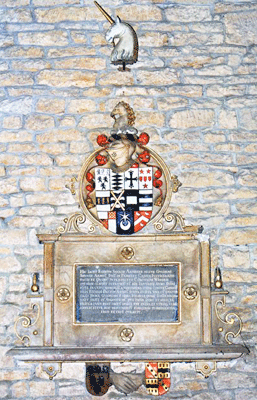 Apparently Gregory King, Lancaster Herald of the College of Arms, had directed the arms to be placed on the monument, and it is interesting that he married for his second wife Frances Grimes the Countess’s sister! 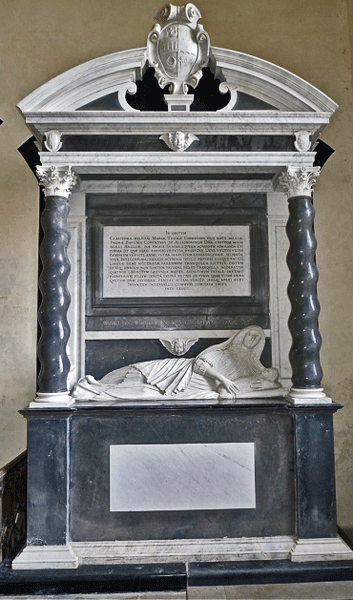 So by this ‘scam’ both the Earl’s second wife, and Lancaster himself by association, had a meteoric rise in the Social Register. 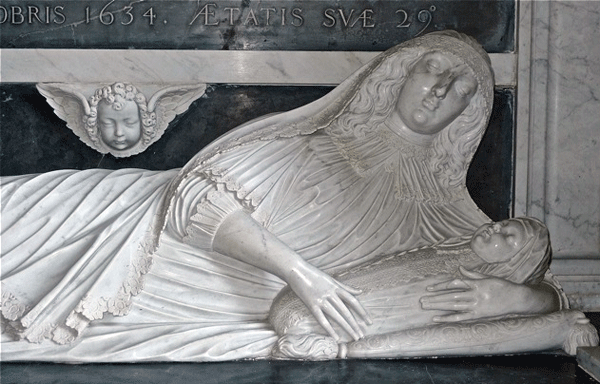 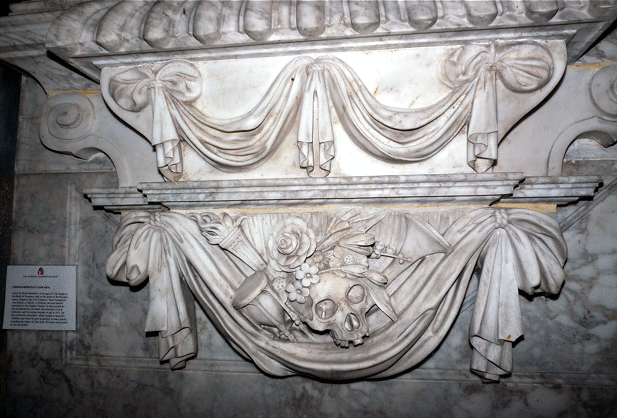 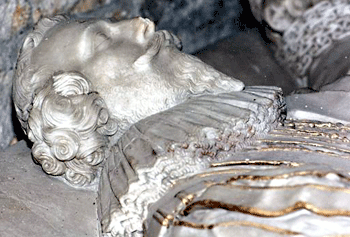 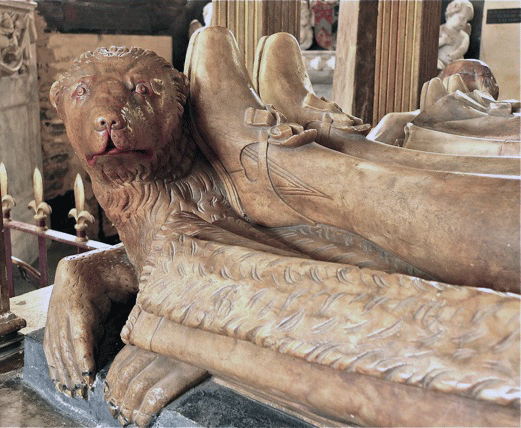 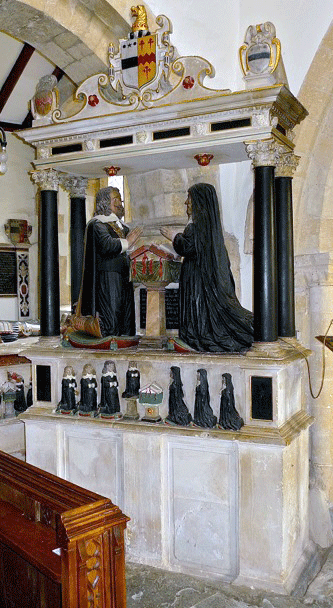 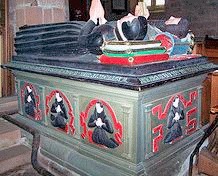 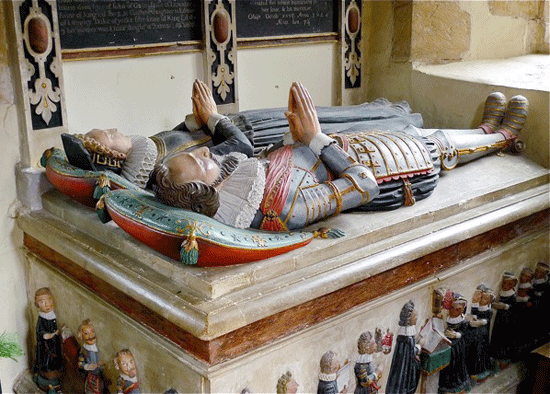 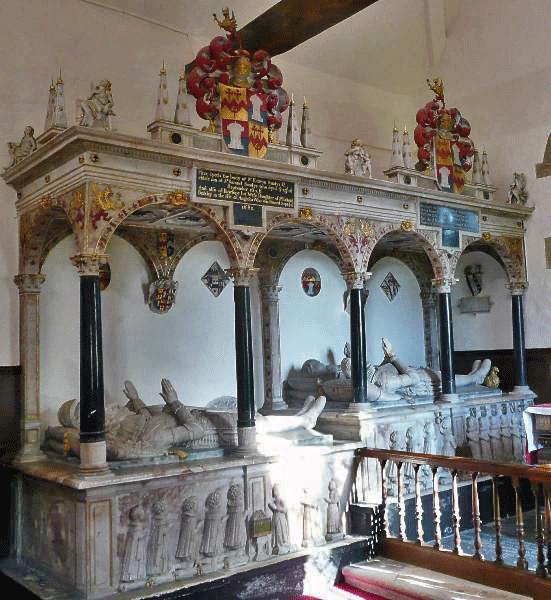 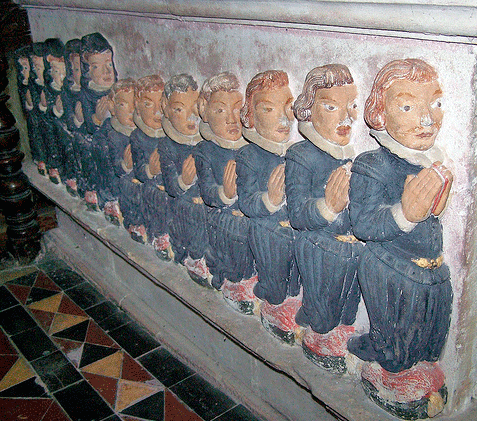 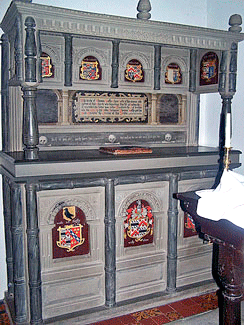 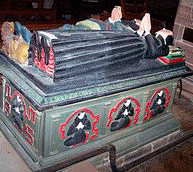 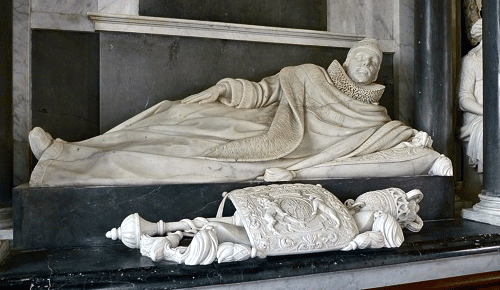 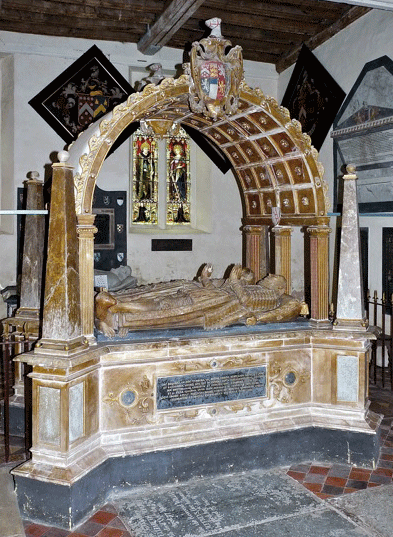 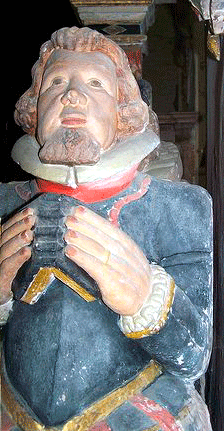 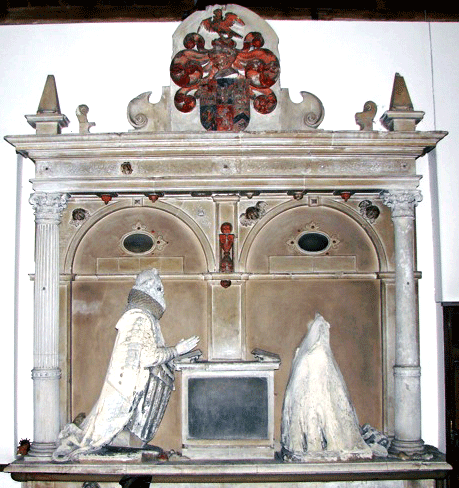 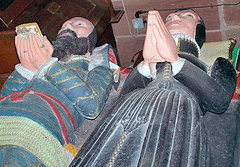 Left and above Edmund Coles (1606) 'a man of bad character' Until the 19th century he wore a real leather skull cap William (1615) & Mary Coles from their kneeling effigies on a tomb chest on which kneel their children, shown below. 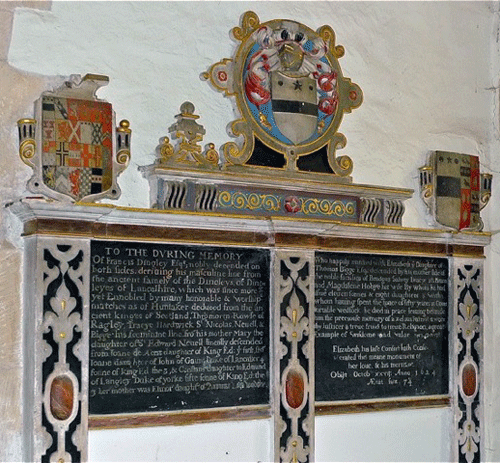 Left: Essex Devereux (1639). 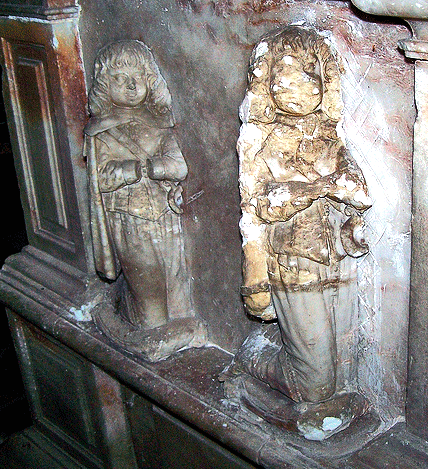 Note the little girl sitting on the ledge below; she is shown above right. 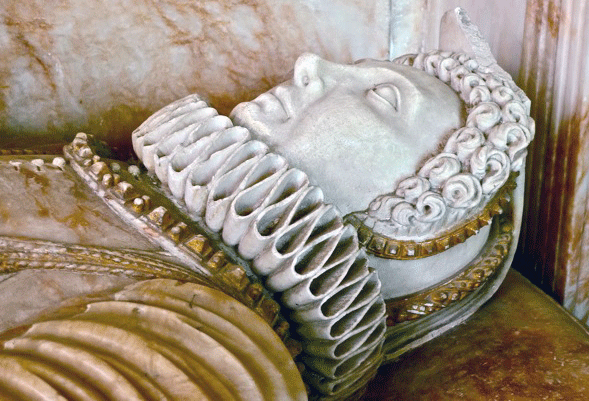 Pity she can't be photographed at a better angle. 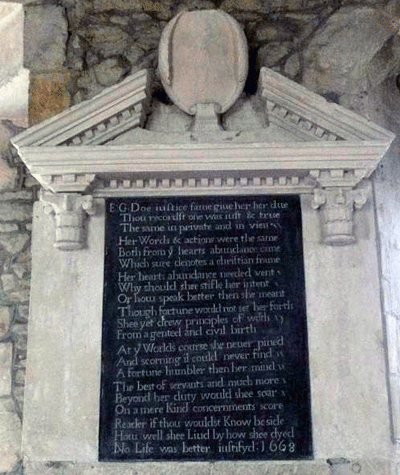 'Of your cheryte pray for the sowlhs of Wyllyam Parker, Sebyll and Elizabeth hys wyfys yw whych Wyllyam died the xxy of Febyere in the yere of owre Lord God m.ccccc and Viii ' 'The tombe of Thomas Walshe esquier Lorde of this manour and patron of this church who departinge this life at London the 21 of November, his bodye was hither translated the 21 of December AD 1593 by his cosine jarmaine Thomas Walshe gent his sole executor the erector of this tombe' Rare painted tomb. 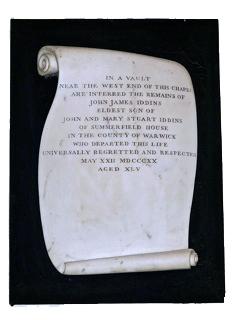 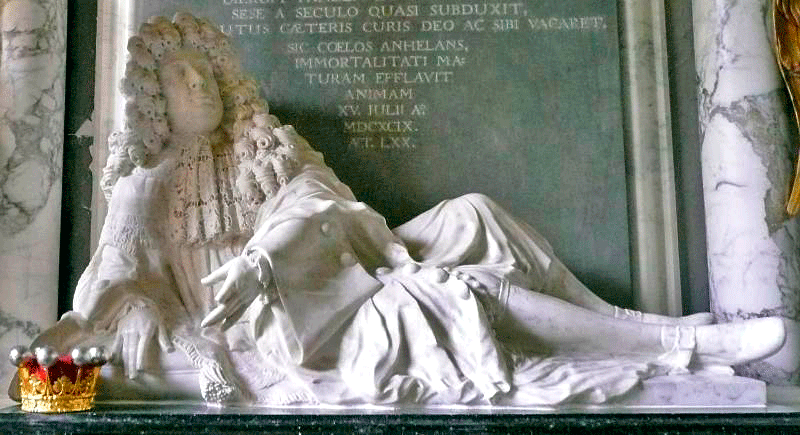 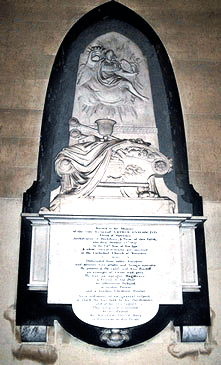 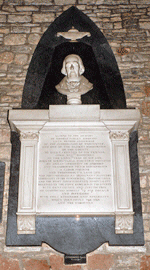 With many thanks to Dr John Physick, formerly President of the Church Monuments Society, for allowing the use of his photographs of some the monuments in Worcester Cathedral; others are by theWebmaster. 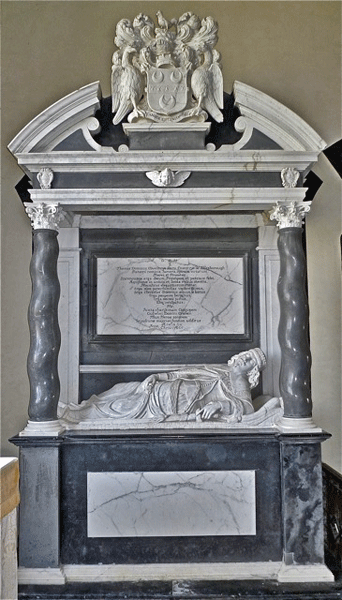 Thanks again to Sally Badham for the photograph at Elmley Castle; and to Dr John Davis and Jean McCreanor also for the remaining photographs. 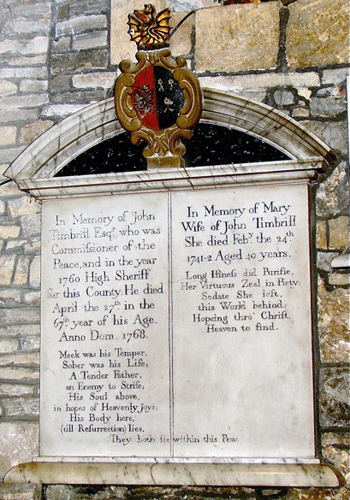 Also to Joan & Bob Tucker. 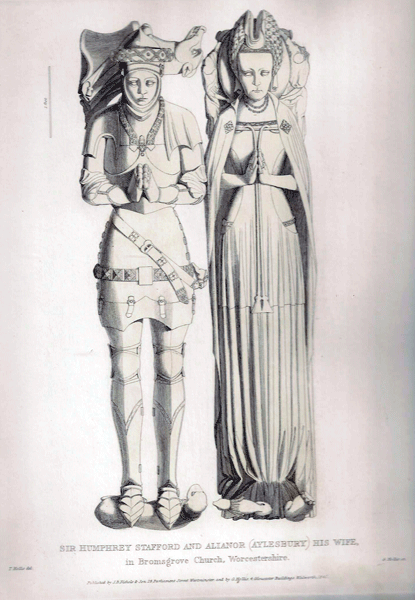 The etchings are from Hollis's book.